Who doesn't love giveaway events? I know I do. They're my favorite! You can always expect great prizes, and believe it or not, I think I saw earlier today, that Christmas is only 10 Friday's away! So I'll be participating in as many as possible, to help you all start winning some awesome Christmas gifts : )! Anyway - This is for an awesome prize, valued at close to $300! And would make an amazing gift for any coffee lover in your life! So enter below, and good luck : )!! 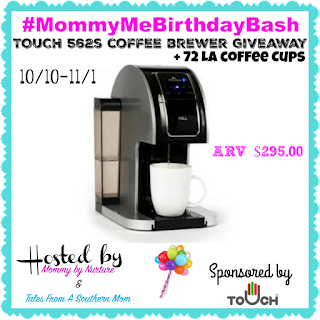 "Welcome to the 2nd annual #MommyMeBirthdayBash with your hostesses Mommy by Nurture and Tales From A Southern Mom. With a carefully selected array of fun prizes perfect for Moms and toddlers you are sure to find plenty of giveaways to enter from 10/10-11/1. To find more giveaways to enter during the event please click here. Warranty: 1 Year Manufacture Warranty"
Disclosure: This giveaway is in no way affiliated with any social media platform such as Facebook or Twitter. If you have any questions please contact Nichole at mommybynurture(at)gmail.com. Sponsor is responsible for shipping prize to winner and it can take up to (8) weeks. Winner has (48) hours from time of email sent to reply to confirm winnings or another winner may be selected. Winner must reside in the Continental USA or entries are void. Lil' Blog and More received no compensation for this post. I would use this immediately for me and my hubby! We have an old dinosaur of a coffee maker, and it's way past the time to get a new one! This would be a gift for ME for NOW! I've always wanted a K-cup coffee maker! This would be MY Coffee Brewer for sure. Not sharin' with anyone! Thanks! Comment on this page telling us who would be the lucky recipient of this prize and if you would be stashing away for a birthday gift or holidays! If I won, I would kep this for our house. Our current coffee maker is on the fritz. I'd give this to my sister and brother in law. They are coffee addicts! I'd keep this for myself and my boyfriend. I would love to win this for myself. I love coffee and this would be perfect to use for the various flavors I like.